This post is sponsored by Princess Cruises, and contains affiliate links. All opinions are my own! The first port on our 11 Day Scandinavian Cruise was Oslo, Norway. 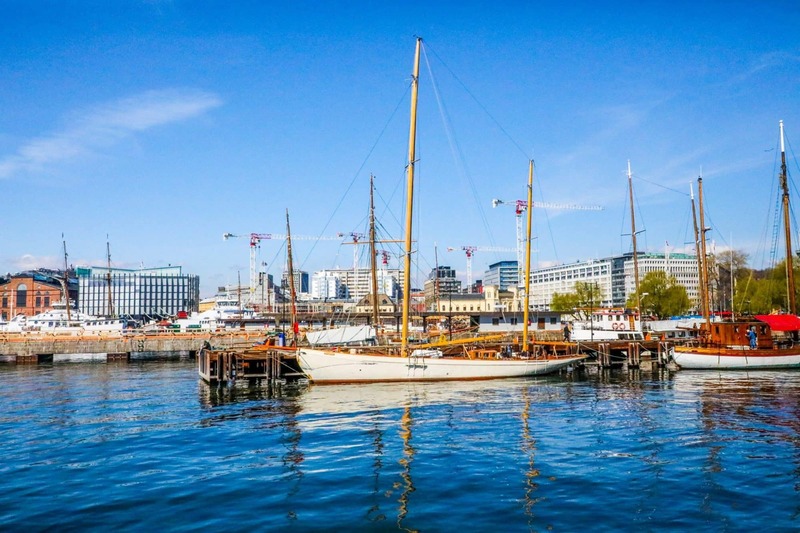 Unlike a lot of cruise ports, Oslo is a great way to start a trip, since you literally dock right next to the city, and everything is a short stroll from the ship! 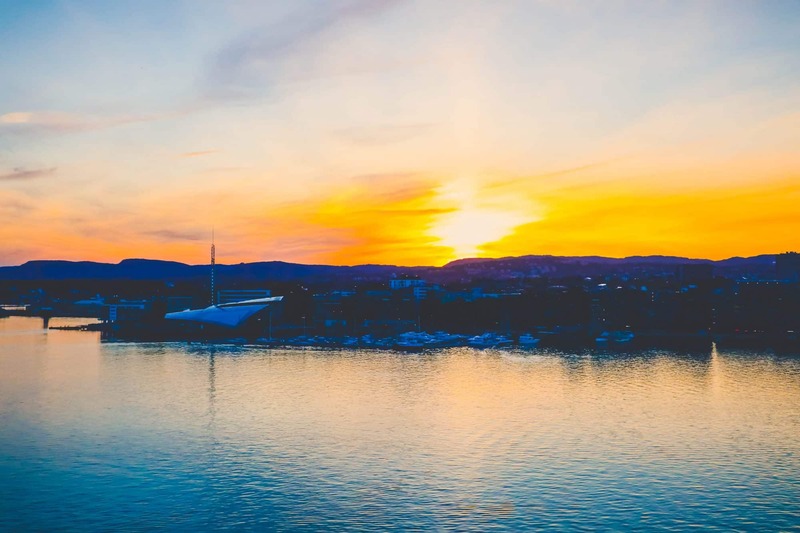 It was especially nice that Oslo is a part of Princess’ More Ashore program – where the port hours are extended, giving you more time to explore a city. 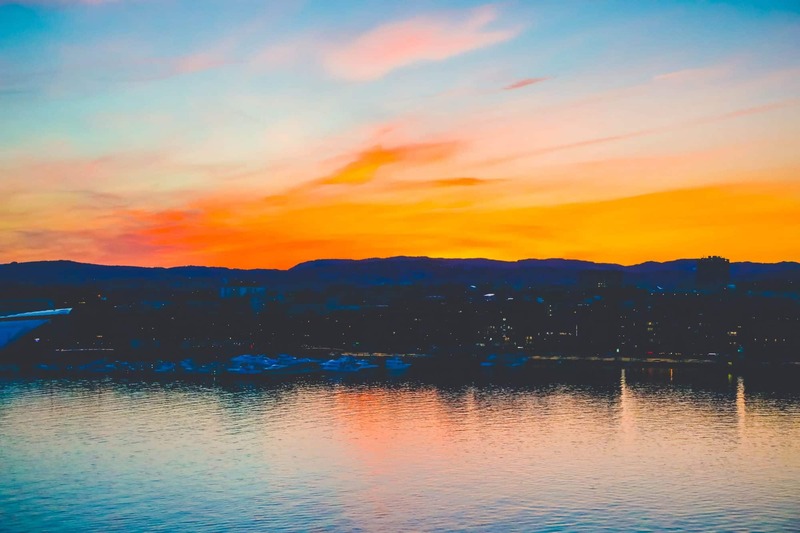 Oslo is Norway’s largest city, and full of important social, historical, and natural wonder – making it a fabulous stop! It feels both like a large city and a small, cozy town at once – and is full of places to stop and explore. 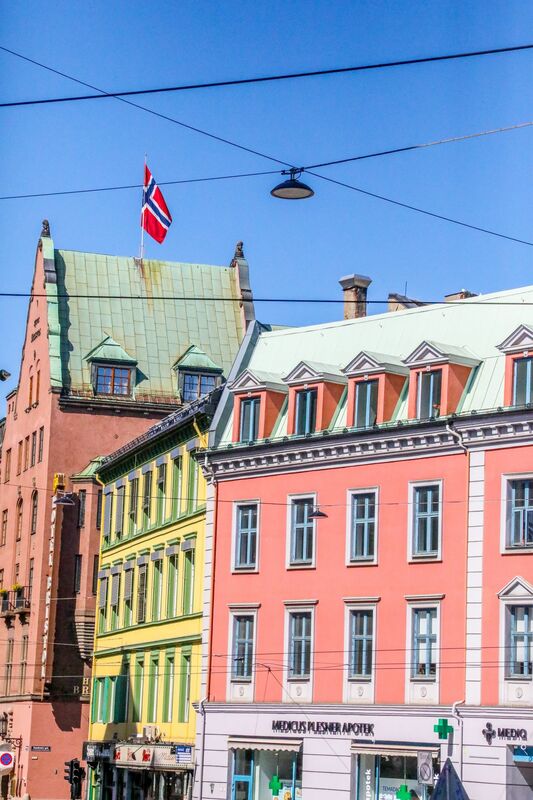 Oslo is also a photographer’s dream – full of candy-colored houses, pretty panoramas, and tons of places to peek around in. While it wasn’t ideal as a tourist to visit Oslo on May Day (as it is recognized as a national holiday for workers and basically everything non-restaurant/grocery, or essential healthcare operations, are closed), we had a great time checking out the parade/protest march and walking through the normally-busy suddenly-quiet city! 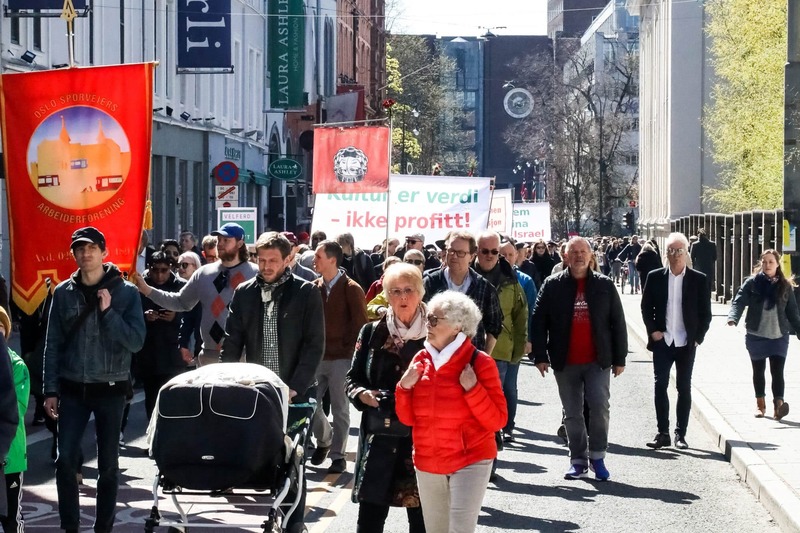 It was really cool to see one of Norway’s most prized traditions, however – the Norwegian tradition of peaceful protest is very much still alive and well even amid tense times, politically and socially. We stood aside the parade and watched protesters carrying info on all sorts of issues, and the whole atmosphere was nothing but calm, peaceful, and respectful – even with opposing ideals being represented. As someone who has a lengthy background in politics in America (I worked in the United States Senate and was employed as a lobbyist for a while before starting Sweet C’s), it was really interesting to me to see the different groups involved in the march, the incredibly peaceful nature, and the laid-back jovial attitudes everyone had. While it was a bit hard to follow along with the signs people carried (as they were not in English), we started chatting to a Norwegian filmmaker (who lived in Los Angeles right down the road from my cousin for a long time!!) who helped explain some of the groups and signs we saw pass by. 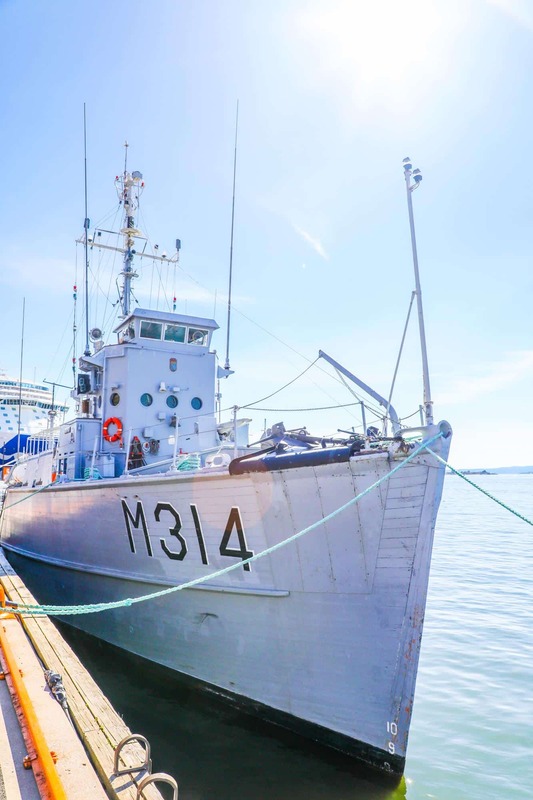 As I noted above, Oslo is a really cool city to dock in from a large ship, because unlike other places where you might have to take transportation into town, in Oslo, you’re just steps from the action! Right off the gangway there are the typical shops and restaurants greeting cruisers, but you only need to go a couple blocks to be fully in town. 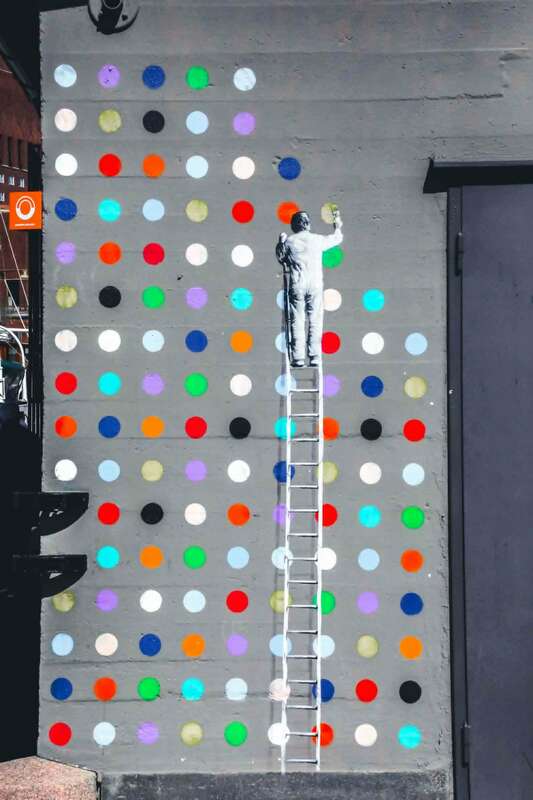 The first stop off the boat for my cousin and I was to snap a couple shots of one of Oslo’s bright and colorful street art pieces – I love this man painting on the side of a building! It felt incredibly Banksy-esque, and set the tone for more fabulous vignettes we’d find around Oslo. Next, we ran into Ashley and Jared from Sugar and Cloth (I absolutely love them- they are so so so sweet and real, and hello- their pictures are stunning!) and headed for some coffee and treats. 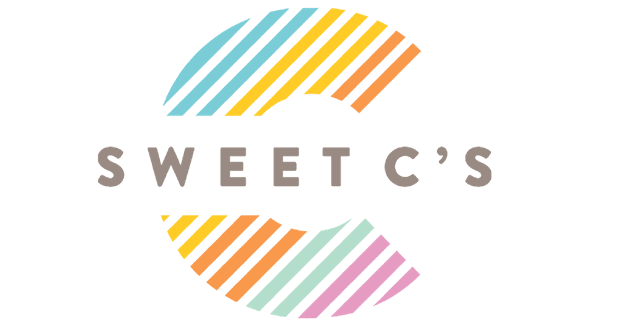 Right as we found WB Samson (home of what has been voted Oslo’s best cinnamon roll, as well as many other tasty treats), we saw Tamara from Champagne and Macaroons and Chelsea from Truelane, and we all tried each other’s goodies. 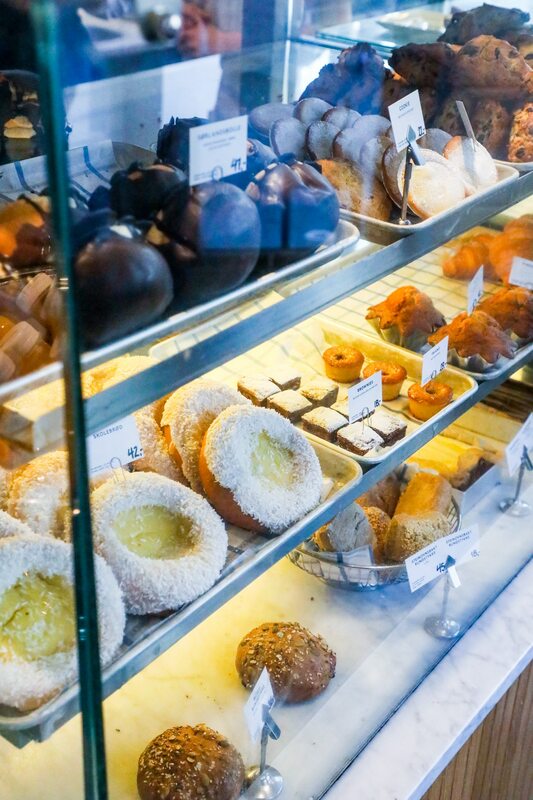 I can objectively say that despite not trying out other bakeries in town WB Samson was my clear favorite – because honestly, it was just SOOOOO dang good! I even purchased a bag of beans to bring home to my husband (we love checking out different coffee roasters all over the world), and loved their beans. Sidenote – the Scandinavian region as a whole has some of the best coffee- which isn’t always a given in north/western Europe. 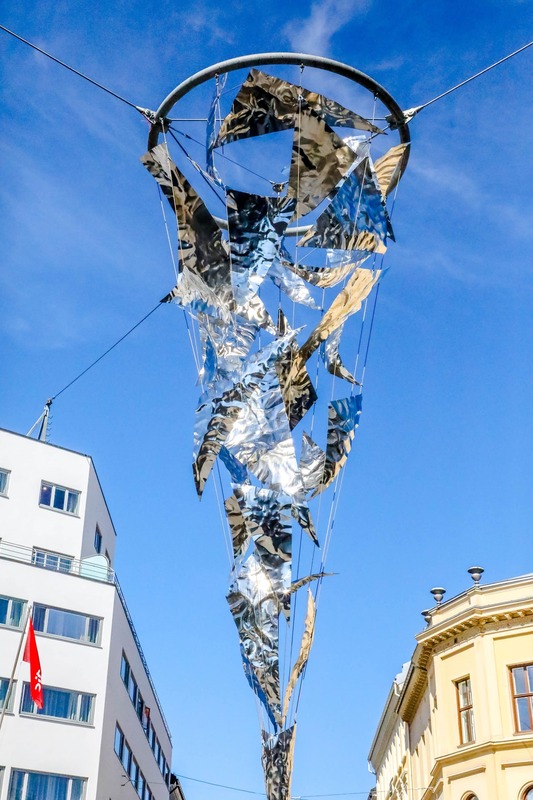 While the Oslo Sculpture Park is a major highlight for art lovers in Oslo, my cousin and I decided to seek out more of Oslo’s urban art displays. 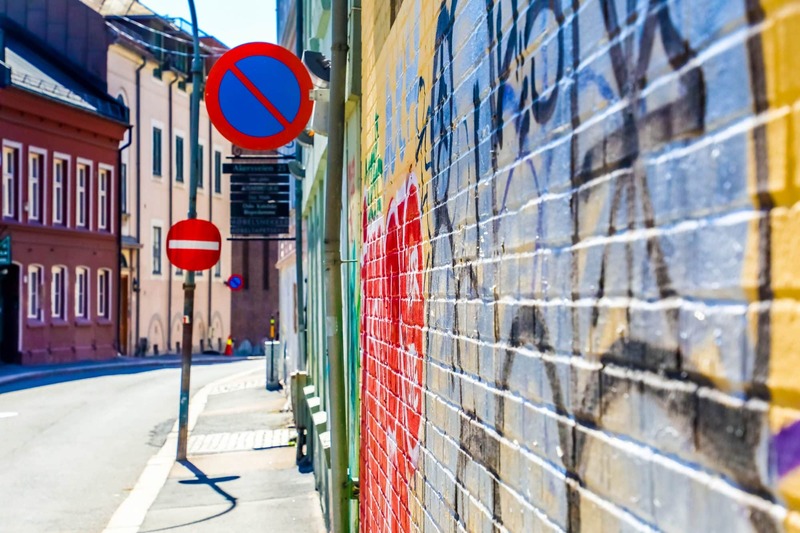 We both have always loved graffiti murals, as well as urban sculptures – and Oslo was really a treat for us! We ran into numerous sculptures around the city, and I loved how many were dedicated to depicting both women and children. 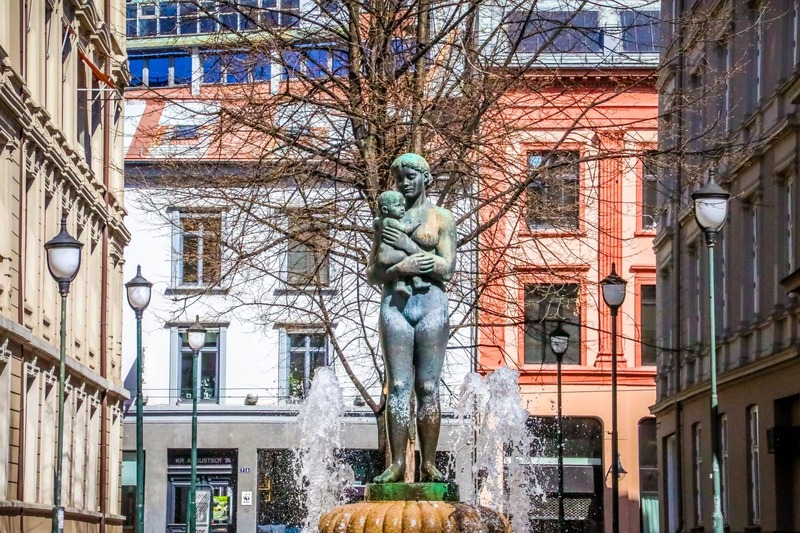 Motherhood seemed to be a major sculptural theme in Oslo – which I couldn’t help but stop and connect with! It was awesome to wander up and down the streets and discover interesting, colorful, and moving pieces just about everywhere. Oslo was full of color and unique pieces, as well as some seriously on-point graffiti! 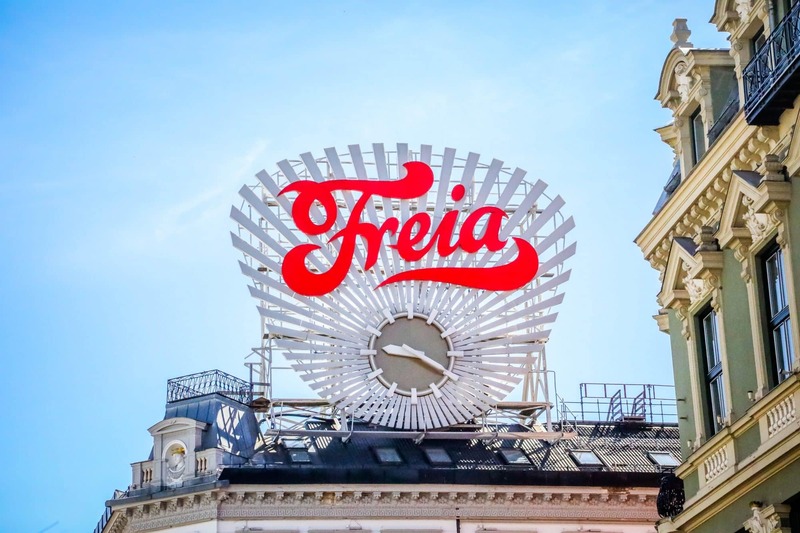 Even the advertising was gorgeous in Oslo – Norway has a serious obsession with sleek, gorgeous design! 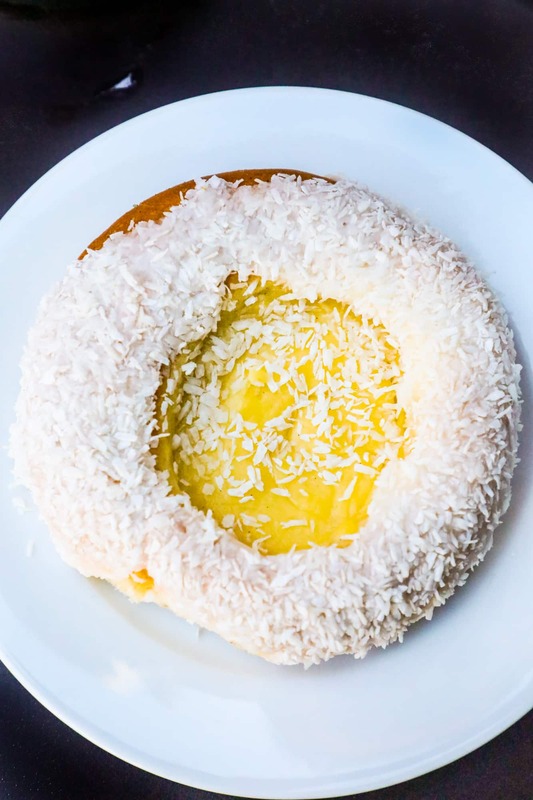 Scandinavian pastries are world class – and Oslo serves them up beautifully with delicious artisanal coffee, fresh and delicious seafood, and famously Scandinavian open-faced sandwiches at the numerous cafes throughout the city. 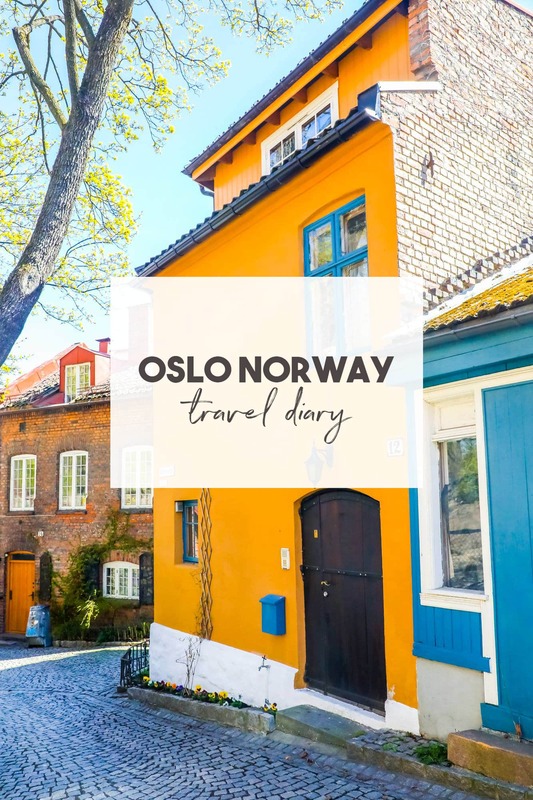 As we were only in Oslo for a day, this list reflects the places we visited and is in no way comprehensive – I NEED to head back and eat more! 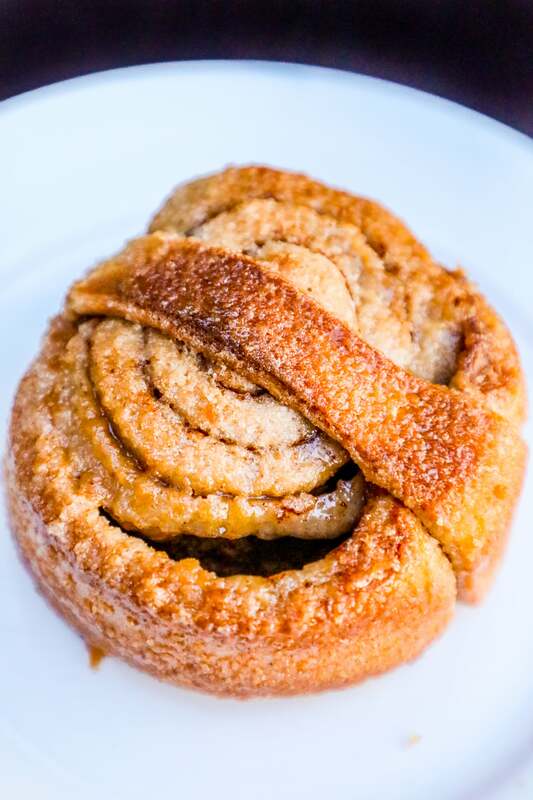 The cinnamon roll (kanelbolle) – which has been voted Oslo’s best by Yelp – a crunchy, sweet but buttery version that isn’t loaded with sticky gooey icing like the American version. School Bread (skolebrød) – a danish-like flaky pastry filled with a creamy, indulgent vanilla filling. 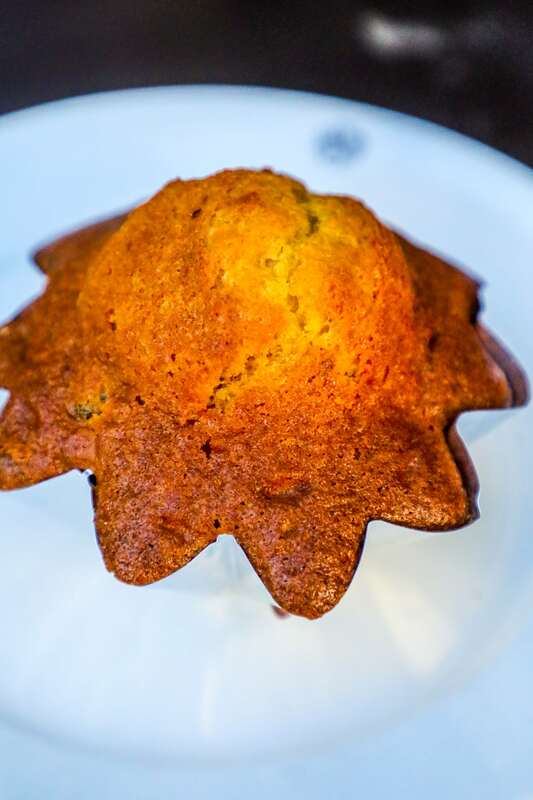 Jacob Muffins – a traditional Oslo muffin baked in a tin that is buttery, flaky, incredibly moist and full of raisins. We also ordered up espresso and juice, and loved everything. I could have literally spent all day there eating EVERYTHING! Another stop for us was to the Magic Ice Bar – which I will admit, I was a little underwhelmed by, but only because even by Norwegian prices, it was extremely expensive. It was also super quiet and just my cousin and I in the entire bar, which was really weird – however – if you’re heading in with a group, the ice bar would be a lot of fun! When you walk in, there is a large gift shop full of Norwegian goodies to peruse, while you buy tokens for entrance and for your drinks. 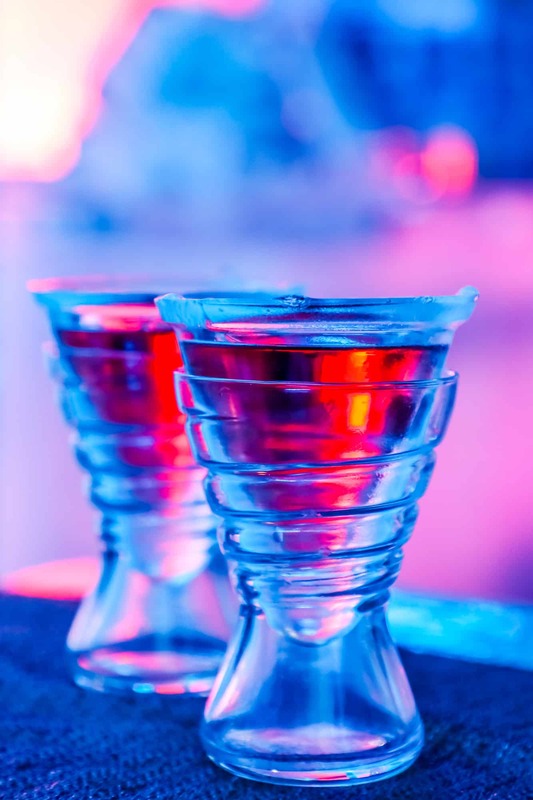 You’re then led through an air-lock into the bar, where there are tons of sculptures, bright lights, and fun nooks and crannies to explore. 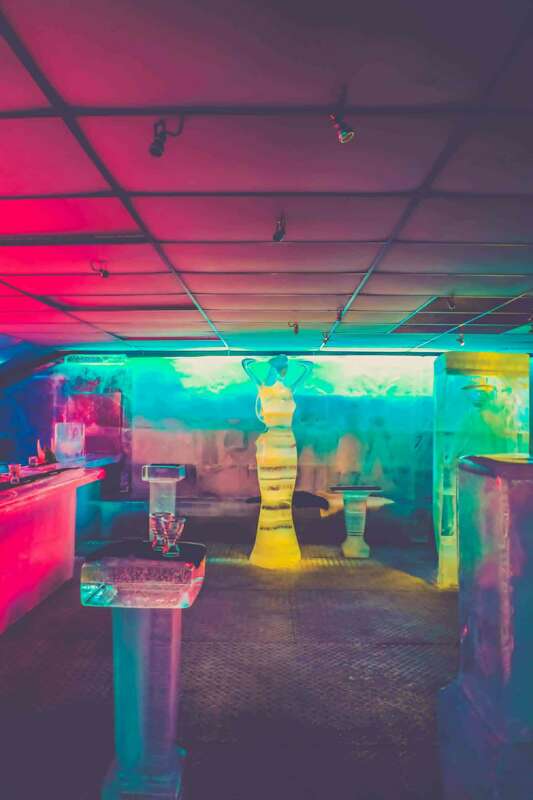 It’s incredibly pretty inside, and they did a great job giving a nod to Oslo’s rich artistic identity with ice interpretations of some of Oslo’s most famous sculptures! The lighting is always changing, so it was really fun to sit with a camera and snap away to see what we could capture. While it was a bit quiet while my cousin and I were there, we had a blast checking it out, taking in the lights, and just having a nice place to “chill” (sorry, had to!) for a while. 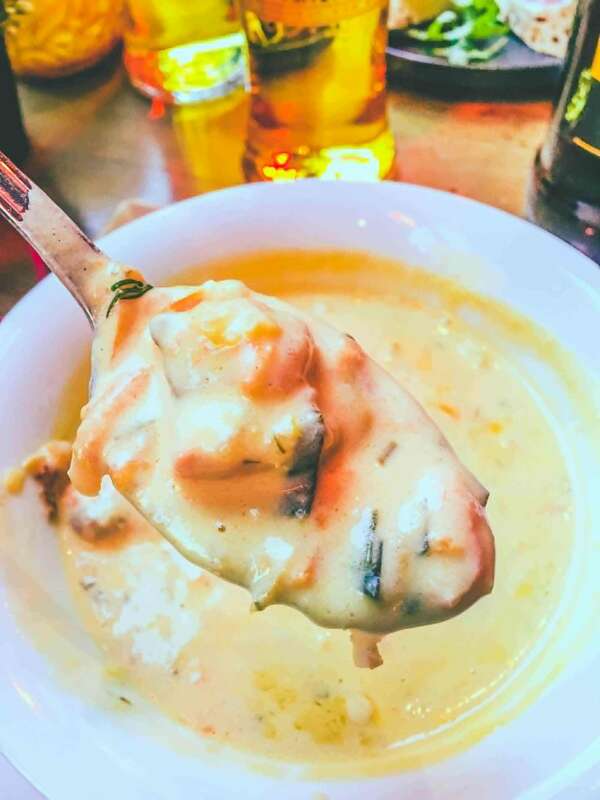 If you’re with a big group of fun people (hello, bachelorette parties or a girl’s trip!!!) 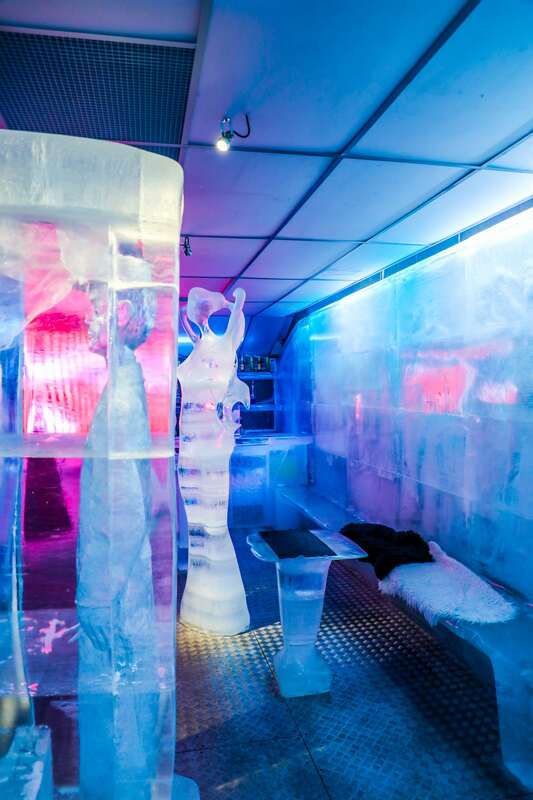 the Ice Bar would be a definite must. I’ll admit – we actually ended up at Cafe Cathedral – a somewhat local spot- by accident. We were walking to a very highly-reviewed seafood restaurant I saw and was dying to go to, but we walked all the way there only to find it closed because of the May Day holiday. With grumbly tummies, and the ship a 20 minutes walk away, we decided to duck into the Cafe Cathedral (whose round, sweeping patio was a perfect place to watch people walk by and relax – plus they played the most amazing music) and had some great traditional food. 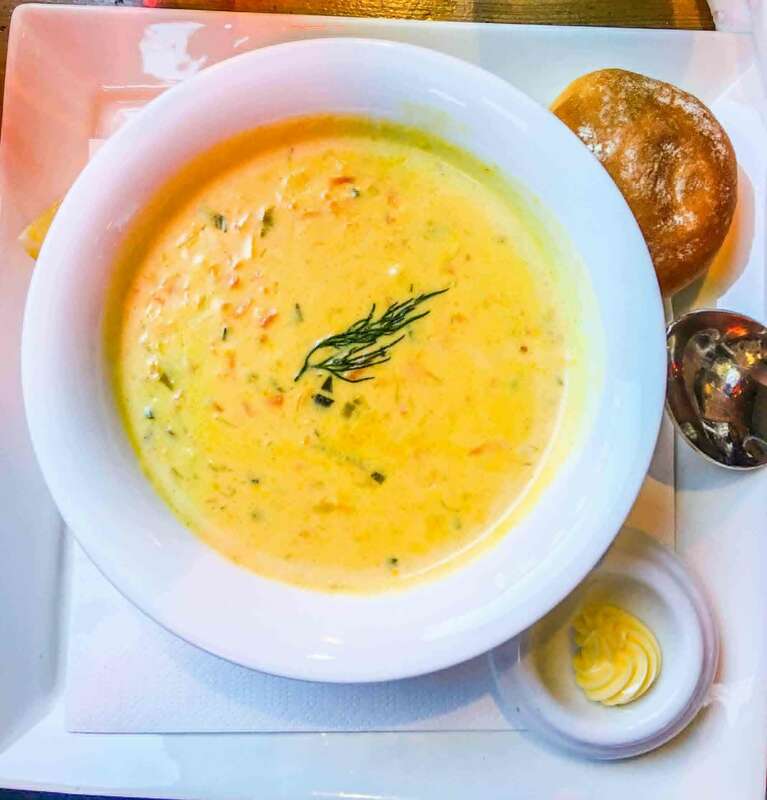 We ordered the fish chowder (since it was the one thing I was craving the most – I am a HUGE fish chowder fan! 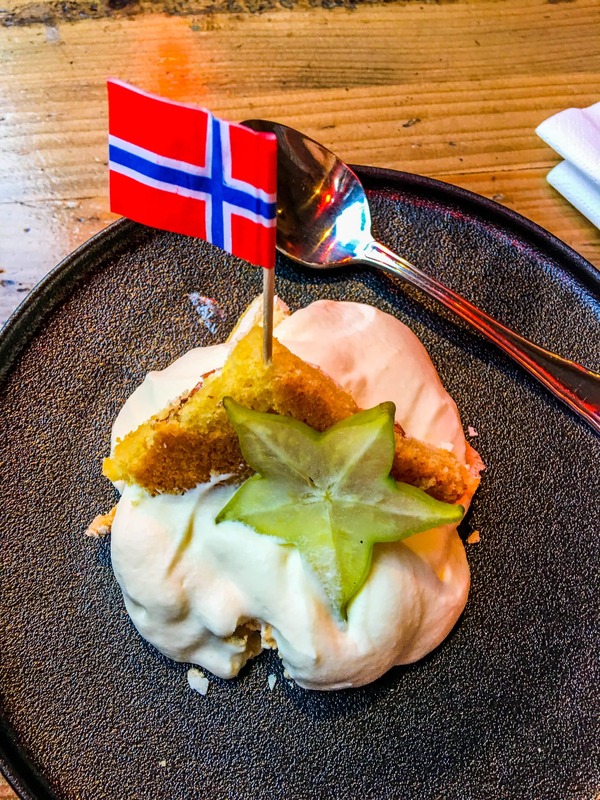 ), some Bulmers on ice, and a Verdens Beste – the Norwegian National Cake (a sponge cake with whipped topping – fluffy, airy, and so deliciously creamy!). It was fantastic and very reasonably priced. 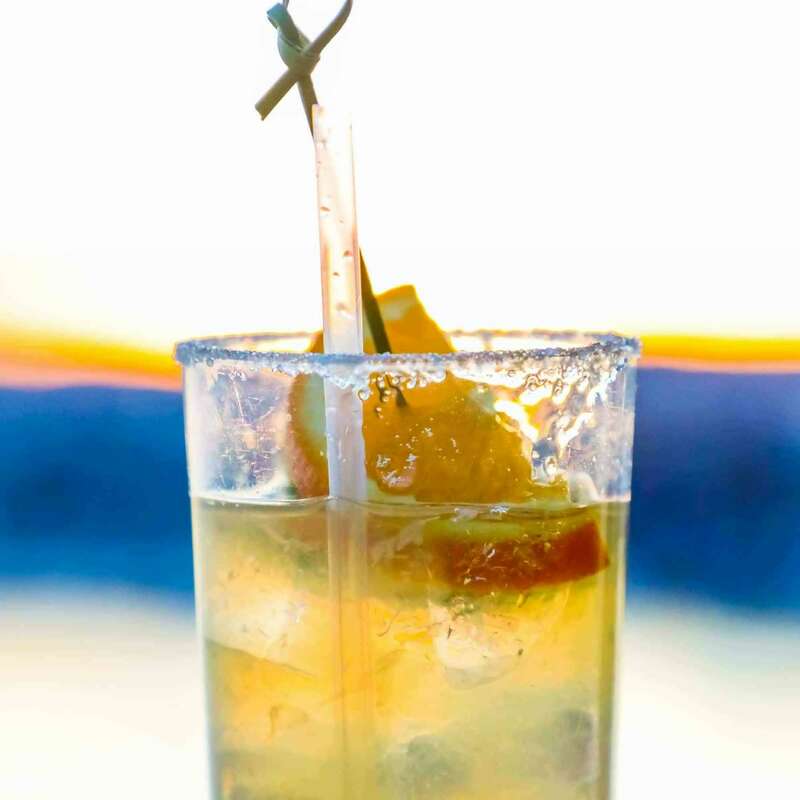 We then headed back to the boat for some cocktails from the Margarita Bar on the back of the Regal Princess, so we could watch the sunset as we pulled out for our next destination – Berlin!